The kids are all right but the parents might not be in this engaging beach read about the past we never leave behind even as we're confronted with the future. Elizabeth, Andrew and Zoe, and Zoe's wife, Jane, have all the ease and resentments that come with long friendships and marriages. Over the course of an eventful summer, two pivotal events test their complicated bonds — their teenage children, the sweet and naive Harry and the irrepressible Ruby, start sleeping together, and movie producers come calling for the life rights to a movie about their dead ex-bandmate, Lydia. Lydia looms like a specter, driving a wedge even after death between Elizabeth and Andrew, as Elizabeth is eager to see the movie be made and Andrew refuses. He then gets swept up in the mystique of a yogic community in a very midlife crisis way. Meanwhile, Zoe and Jane, co-owners of restaurant Hyacinth, contemplate whether to divorce. This was a 3.5-star read for me, but I'm rounding up because it's so well done, and I recognize my personal bias toward darker fare plays a role in why I didn't enjoy it even more. This book is wise but not profound. It's written in neat prose that's evocative and quotable but never purple. I liked that it captured a tense mood and a sense of place, that it all felt very fragile, like a moment in time in a bubble that would inevitably pop before another is blown. It felt true to life — you live and know that one day, you'll look back on this exact moment, this feeling, and be somewhere different. Even though there was a strong sense of waiting for the other shoe to drop, the stakes never felt very high. Seeing interracial couples and LGBT couples represented is always a personal thrill for me, and Straub did both, veering from cliches and stereotypes and presenting characters that didn't feel like tokens. And there was no fuss made about it. It just was what it was, totally normal, nothing to see here. Young love's obsession is so brilliantly contrasted with waning love. Harry's fixation on Ruby was so familiar to anyone who has had it bad, who remembers the agony of first love. "He watched the red end of Ruby's cigarette move up and down to her mouth. It got brighter when she inhaled, and for a second Harry imagined that he was the cigarette, his entire body, and when she drew the smoke into her lungs, he felt himself slip inside her throat and slide down into her body." The character who had the most depth for me was Elizabeth. As the most subdued character, she had to most room to blossom. This felt most like her story of recapturing not her youth, but something she maybe only flirted with in the past, which was truly becoming "mistress of herself," as the song at the heart of the novel goes. I thought her relationship with Zoe was so interesting and complex, and she really started coming into her own in her marriage and as a mother. I was rooting for her. "It was just that sometimes she thought about all the experiences she'd never gotten to have, and all the nights she'd listened to the sound of her husband's snores, and wanted to jump out a window and go home with the first person who talked to her. Choices were easy to make until you realized how long life could be." This book will also make you hungry. I loved reading about Jane's cooking and the dishes at Hyacinth, and there was so much sensual pleasure in these pages. It felt like comfort food. 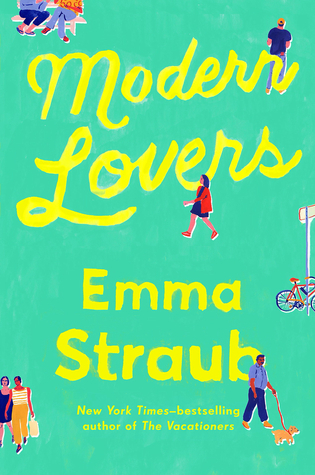 This is my first Straub novel, and she's definitely on my radar now. Her writing is like a cold pitcher of lemonade sipped on a hot Brooklyn porch.